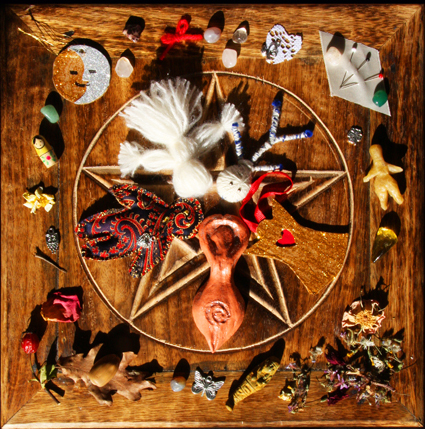 Dolls, effigies and images of people, animals, spirits and deities have been used for magical purposes since really early times. In fact, image magic is prehistoric. Cave paintings might have been used for this, although we don’t for sure. 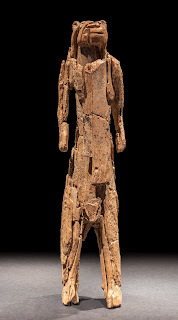 The earliest humanoid figurine discovered is that of a lion-headed person known as the Lion Man – although the gender is a bit uncertain. It is 40,000 years old. The Lion Man was found in a cave in Germany, where it had probably been placed because it was significant to the people who originally owned. It was on display in London at the British Museum in its Living With Gods exhibition earlier this year and you can see a picture of it on the left. The earliest known entirely human figure is the Venus of Hohle Fels. It is an Upper Palaeolithic figurine of a woman with a large belly and breasts – I’m sure you’ve all seen images of it. 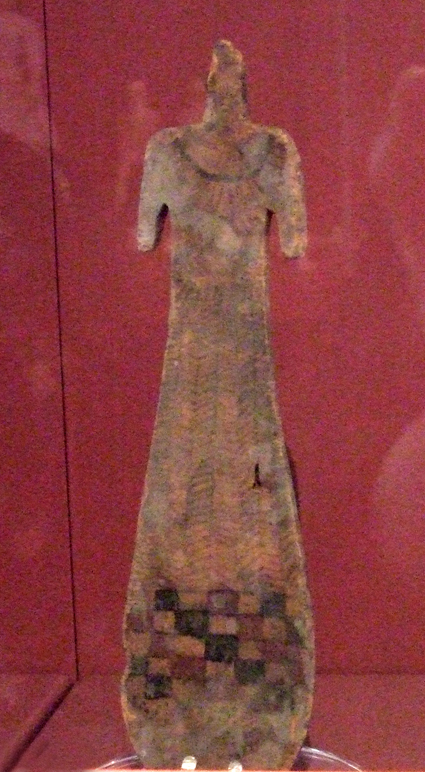 It is one of many similar models of female forms found in Europe. No one knows exactly what these “Venus” figurines were made for, but there are theories they might have been used for fertility magic or could have represented a goddess or matriarchal ancestor. By the time of the Egyptian and Mesopotamian civilisations, image magic was really popular. One of the oldest spells recorded – on a Mesopotamian clay tablet from the second millennium BCE – is a healing spell that involves creating a clay effigy. It is a cure for dog-bite. According to Professor Owen Davies, in The Oxford Illustrated History of Witchcraft and Magic, the spell instructs you to take some clay, rub it on the wound and then use it to form a small model of a dog. You say some words over the figure and leave it outside facing the sun to dry. As that happens, so the wound is supposed to dry up and heal. The Ancient Egyptians believed all statues and images contained something of the spirit of what they represented. One example is the ‘ushabti’, or ‘answerers’, which were small figurines representing servants. They were put into people’s tombs and were intended to do their bidding in the afterlife. They used a lot of effigy magic. Ancient Egyptian children played with paddle dolls – carved from wood in a ‘paddle’ shape – but these toys were also believed to have ritual powers. Their shape exaggerates the hips and female reproductive region and they were thought to promote fertility. Some, like one in London’s Cuming Museum, were also painted with the figure of the hippopotamus fertility goddess Taweret, who protected women during childbirth. In Graeco-Roman practice Kolossoi were small dolls used for spells – often curses. They were named for a victim, melted or broken and then taken to a cemetery where the spirits of the restless dead could be asked to give the person casting the spell what they desired. This technique probably travelled to Britain. It is quite possibly the origins of folk magic using effigies in this country. Although they have often been used for curses here too, they have also been used for positive intentions including healing. People would sometimes make wax effigies of themselves - or parts of their bodies that were injured or infirm - and leave them at sacred sites. They believed that the figurine would continue to represent them after they had left the location and that the energy of the place would help them recover from an illness or accident. You can see an example, as well as other types of poppets, in the Spellbound exhibition currently on in Oxford. 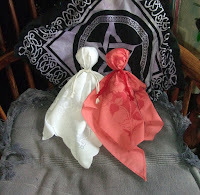 Magical dolls came to be called ‘poppets’ in traditional English magic. It comes from the Middle English word spelled ‘popet’, meaning a small child or doll. Since medieval times, that could refer to a small human figure used in witchcraft as well as for children’s toys. According to Martin Duffy in his book Effigy, the earliest written mention of the word poppet in England is in a 10th century charter in which a widow and her son were charged and had their land confiscated for putting an iron nail in an effigy of someone. A poppet is also a name of endearment meaning a sweet little thing, often used for a favourite child. When I create a magical doll, I think of it in some ways like a little child, although one made of fabric, wood, clay, wax or other things than flesh and blood. I prefer not to use the term ‘Voodoo doll’ because it is a common misconception that a principal element of Voodoo (or the folk magic tradition of Hoodoo) is sticking pins into dolls as a curse. That misconception comes from 20th century books and films by white Americans and Europeans who didn’t fully understand the traditions of a different culture. The term ‘poppet’ is older and is less associated with cultural appropriation. You can find out more in my book Pagan Portals - Poppets and Magical Dolls, which is published my Moon Books. You can also view my author page on Amazon to find links to that and my other titles. Photos: Top Right: A variety of poppets, photo by Lucya Starza. Middle left: Lion Man Stadel Cave, Baden-Württemberg, Germany, 40,000 BC The Lion Man sculpture from Stadel Cave in south-west Germany is the oldest known evidence of religious belief in the world. © Museum Ulm, photo: Oleg Kuchar, Ulm. Middle right: Paddle Doll in the V and A Museum of Childhood. Bottom left: Two handkerchief poppets by Lucya Starza. Lucya has a vast amount of knowledge and we really enjoyed her recent workshop at Epping for the Rainbow Healing Sanctuary. Excellent book on Poppets and Magical dolls so do buy yourselves a copy. Thanks Lucya for not only the workshop, but the ginger bread. Thank you very much indeed! Glad you enjoyed the gingerbread!